One of the country’s most prestigious museums will face a strike by cleaners and maintenance staff in the PCS and Unite unions over plans to outsource their work a private for profit contractor. The strikes planned so far are on Monday 29 October 07:00-10:00 and on Monday 05 November 16:00-19:00 and there will be pickets at these times. 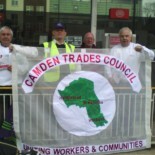 This entry was posted on October 26, 2012 by CAMDEN TRADES COUNCIL.